Definition at line 38 of file lldrawpoolground.h. Definition at line 41 of file lldrawpoolground.h. Definition at line 49 of file lldrawpoolground.cpp. Definition at line 52 of file lldrawpoolground.h. Definition at line 47 of file lldrawpoolground.h. Definition at line 54 of file lldrawpoolground.cpp. Definition at line 59 of file lldrawpoolground.cpp. References LLShaderMgr::getVertexShaderLevel(), LLDrawPool::mVertexShaderLevel, and LLShaderMgr::SHADER_ENVIRONMENT. 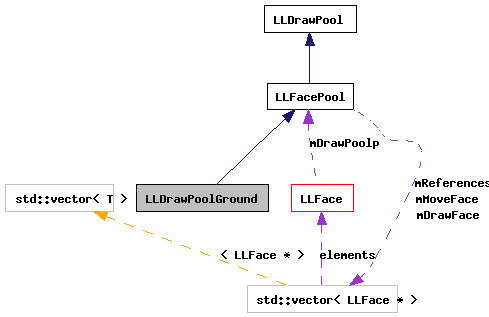 Definition at line 64 of file lldrawpoolground.cpp. References LLPipeline::disableLights(), gAgent, gCamera, LLCoordFrame::getOrigin(), LLAgent::getRegion(), LLViewerRegion::getWaterHeight(), glPopMatrix, glTranslatef, gPipeline, gSky, llmax(), LLFacePool::mDrawFace, LLVector3::mV, LLSky::mVOSkyp, and LLFace::renderIndexed(). Definition at line 103 of file lldrawpoolground.cpp.